Aloha!! 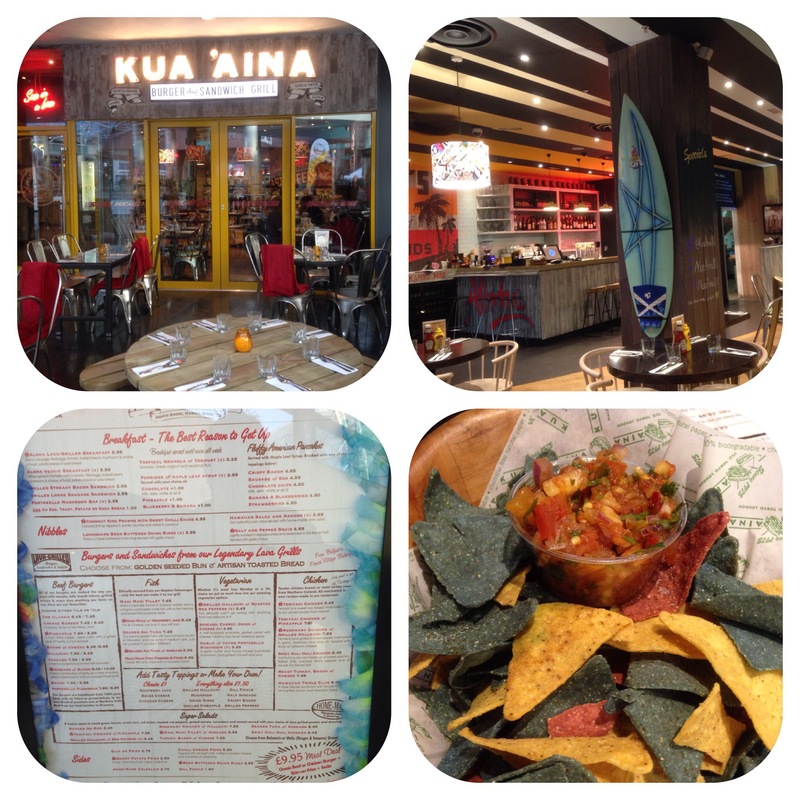 To celebrate my birthday last night, my two daughters, wife and I went to Kua ‘Aina in Victoria Square Belfast. Kua ‘Aina opened in November last year and is another welcome eatery in Belfast. It was the brainchild of Terry Thompson who opened the first restaurant on Hawaii’s North Shore in 1975. It’s famous for its lava rock char-grilled burgers and sandwiches, accompanied by homemade sauces and divine milk shakes. Kua ‘Aina means back country and is a favourite of Barack Obama. The Belfast restaurant is the third in the UK. On arrival the restaurant looked like a typical Waikiki Beach restaurant along with surf board. 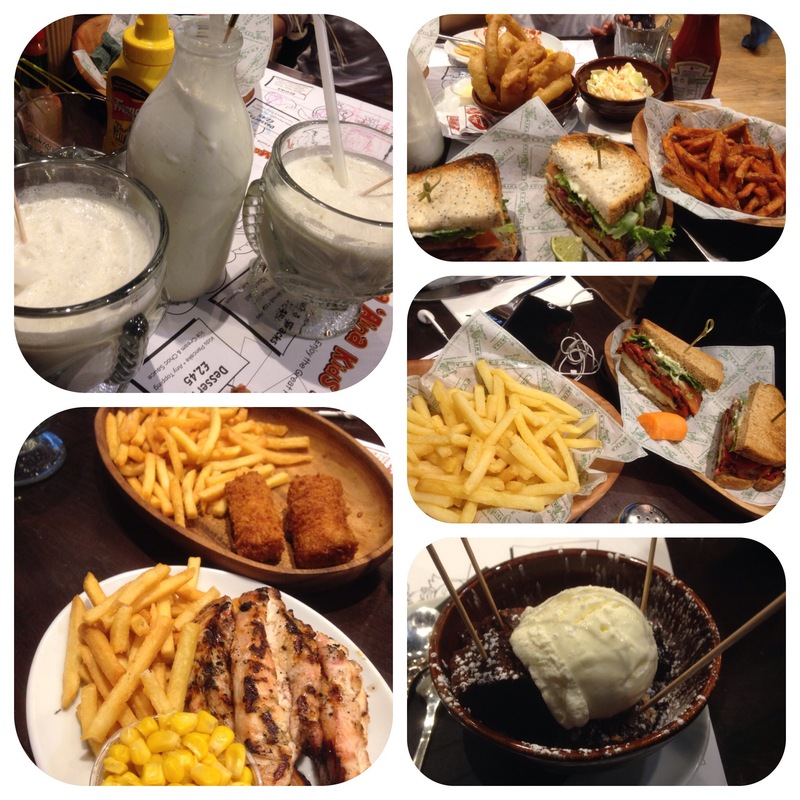 It’s primarily a diner type restaurant which serves various burgers/sandwiches, sides, sauces, craft beers, shakes, soft drinks, desserts and breakfasts!!! We were greeted by Derek who seated us and brought the girls colouring in pencils,paper and menus-I must say it is very children friendly. Whilst we waited for our milkshakes (coconut for me served in a classic glass milk bottle and small bowls of banana shakes for the girls) Derek brought us over multi coloured nachos and salsa. We ordered kids Mahi Mahi fish fingers and fries and Chicken strips with sweet corn and fries. My wife had a halloumi and roasted pepper sandwich and I had a triple decker sandwich of Teriyaki chicken, bacon, lettuce and tomato in poppy seeded bread. To accompany this we had sweet potato fries, homemade slaw, onion rings and mayo. As a birthday surprise I was presented with a lovely chocolate brownie and ice cream. Now the nachos were warm and crisp and salsa was great. The shakes were fab-having mine served in a classic glass milk bottle was very nostalgic! The girls loved their fish fingers, fries, chicken and sweet corn. My wife really enjoyed the Halloumi and pepper sandwich and my sandwich was amazing. The best part was that you could actually taste the authentic flavour of the charring, giving that super taste of original char grilled Bbq. The slaw was crunchy and not too creamy and the onion rings were thick and juicy. The fries and sweet potato fries were nice and soft. Then the brownie was sweet, melt in mouth and warm…mmmm!!! Suffice to say this was a mountain of food and we did have to pack and take home-guess lunch is sorted!! Presentation,service and overall ambience was second to none. This is a great place for an alternative type of burger/sandwich diner. Thank you so much to the team (Ciaran the manager and Derek). Mouth-watering. Belfast has sure come a long way from White’s Milk Bar, The Cottar’s Kitchen, The Scandia, The Coq d’Or, The Royal Avenue Picture House Café – – – bet that’s all a foreign language to you ! Des.